“Giuseppe Borgatti was an Italian dramatic tenor with an outstanding voice. The creator of the title role in Giordano's ANDREA CHÉNIER, he subsequently earned renown for his performances of the music of Wagner, becoming in 1904 the first Italian tenor to appear at the Bayreuth Festival. He sang a variety of leading roles at La Scala, Milan, from 1896 until 1914, but deteriorating eyesight caused by glaucoma put a premature end to his stage career, after which he turned successfully to teaching. Although Borgatti continued to appear in a number of Italian operas after 1896, earning particular renown for his performances in works by Verdi, Puccini and the various verismo composers, he fell strongly under the spell of Wagner's music dramas. From 1898 through into the early 1900s he worked closely with La Scala's principal conductor, Arturo Toscanini, and proceeded to master all the main tenor parts of the Wagnerian repertoire, namely, Lohengrin, Tannhäuser, Walther, Tristan, Siegmund, Siegfried and, finally, Parsifal. The important Wagnerian conductor Hans Richter praised Borgatti's voice and artistry. In 1906, he made a different venture into the field of German opera when he sang Herod in the La Scala premiere of SALOME by Richard Strauss. In 1898, he toured South America with a first-class troupe of Italian singers which included his fellow tenor Francesco Tamagno, the soprano Luisa Tetrazzini and the baritones Mario Sammarco and Eugenio Giraldoni. He also visited Spain and Russia. "De Muro was praised as a ‘tenore di forza’ by no less than Giacomo Lauri-Volpi. De Muro's is a stupendous sound with enormous thrust, natural color and, in the earlier recordings, great beauty." J0977. BENIAMINO GIGLI, w.Zamboni & Carnevali Cond. : Arie Antiche by Caldara, Scarlatti, Durante, Cesti, Monteverdi, Giordani, Bononcini, Fasolo, Carissimi, Bassani & Handel. 12s. 6-10” HMV DA1896, 1906, 1927, 1934, 1955 & 1956, only form of issue, 1947-49, in Elaborate pale-blue buckram HMV Album 457, w.Brochure & texts. M-A, as New. MB 45, the Set. “In a generation, which boasted so many great Italian baritones, Giuseppe Danise was among the most important ones, even though today he is undeservedly underrated. In 1906 he made his début at the Teatro Bellini as Alfio in CAVALLERIA RUSTICANA and soon established himself - yet on provincial stages - as one of the leading Italian baritones. At the Teatro Massimo in Palermo he sang in ISABEAU and in Leoncavallo´s LA BOHÈME in 1913. In the same year he appeared at the Teatro Regio in Parma stepping in for Titta Ruffo as Posa in DON CARLOS (the five-act version with Russ, de Cisneros and Bassi) at the centenary celebrations of Verdi´s birth. As Amonasro in AÏDA he took part in the opening season of the first Verona Festival, again in 1913. 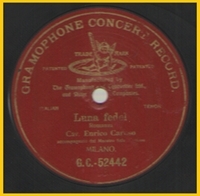 The summer of 1915 saw him busy at the Teatro Colón in AÏDA (with Raisa, Frascani and Caruso), LUCIA DI LAMMERMOOR (with Galli Curci and Caruso), LA GIOCONDA (with Poli-Randaccio and Caruso) and as Schaunard in LA BOHÈME (with Raisa, Galli Curci, Lázaro and Sammarco). At the Colón he also appeared in the local premiere of Zandonai´s FRANCESCA DA RIMINI (with Raisa, Spani and Lázaro). During the 1915-16 season of La Scala, Danise´s début took place in the title role of PRINCE IGOR (with Dalla Rizza, Anitua and Schipa); in the following year he sang in Spontini´s FERNANDO CORTEZ (with Mazzoleni), in AÏDA (with Raisa and Dolci), CAVALLERIA RUSTICANA (with Hariclea Darclée, the first Tosca) and in the Scala-premiere of FRANCESCA DA RIMINI (with Raisa, Dal Monte and Pertile). In 1917-18 he again was heard at La Scala in SIBERIA (with Dalla Rizza and Bassi), TOSCA and in the world premiere of Victor de Sabata´s IL MACIGNO (with Melis and Lappas). On 17 November, 1920, Danise for the first time faced the American public on the occasion of his début at the Metropolitan Opera as Amonasro in AÏDA (with Destinn, Matzenauer, Martinelli and Rothier). His last two performances with Caruso were in LA FORZA DEL DESTINO (with Ponselle as Leonora). Danise remained at the Met for 12 years - until 1932 - and shared most of the big baritone roles with de Luca, Scotti, Basiola, Ruffo and later Tibbett. In his first year he was especially praised for his portrayal of Carlo Gérard in the Met premiere of ANDREA CHÉNIER (with Muzio and Gigli). In 1922 he again stepped in for Titta Ruffo, this time as Carlo V in a new production of ERNANI (with Ponselle, Martinelli and Mardones), which had been absent from the Met for a long time. When Lucrezia Bori sang her first TRAVIATA in 1923, Danise was her Germont-père. and on 5 January of the same year he appeared in the title role of GUGLIELMO TELL in a revival with Martinelli, Ponselle and Mardones. With great success he sang Nelusco in L´AFRICANA and David in L´AMICO FRITZ (with Bori and Fleta), he appeared in the Met premieres of Catalani´s LORELEY and Lalo´s LE ROI D’YS and in the New York premiere of Laparra´s LA HABANERA (with Easton and Tokatyan) and was an excellent Athanael to Maria Jeritza as Thaïs. He bade farewell to the Met on 16 January, 1932, as Count Luna in IL TROVATORE. In 1947 he married the soprano Bidú Sayão and he also taught singing in New York, one of his most famous students having been Regina Resnik. Probably one of the main reasons why Danise has fallen a into oblivion nowadays is that most of his records were made for Brunswick who stopped their production of classical music in 1930 and were not well presented in Europe.